I love mango sambar.We have Mango Tree at my MIL place. Sambar made from that taste so good. They do both normal and sweet sambar. My husband is not a big fan of mango sambar. 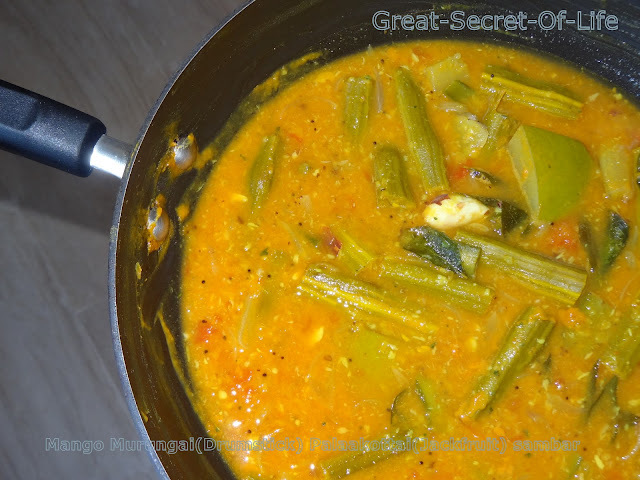 So instead of having plain mango sambar I add whatever I have like Drumstick, Broad beans and jack fruit seeds. Today I had drumstick and jack fruit seeds so I have used it. Put drumstick into a vessel. Add cooked jackfruit seeds and add water just to cover the vegetables. Add tomato pieces, salt, sambar powder, turmeric powder and cook on medium flame for five to six minutes. Then add mango pieces and cook till mango is soft. Mango cooks fast and you have to add after the drumstick is cooked. Now add tamarind juice and allow to boil. Then add the cooked thuvar dhal mashed well. I had jackfruit for the first time two days ago. Now seeing this, I have something else to try. Looks interesting! Thanks!